By Aimee McCarthy | September 25, 2012. The Killers have returned from hiatus with the release of their fourth studio album entitled “Battle Born”. Brandon Flowers and co. promised fans their new album would see the band return to the thumping-guitar-tunes that made their debut album “Hot Fuss” a roaring success. 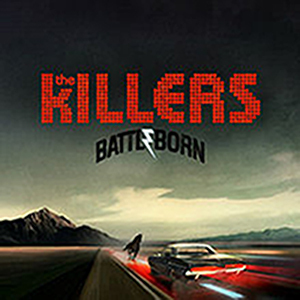 However promises are rarely kept and “Battle Born” represents the love child of The Killers previous album “Day & Age” and Flowers’ solo album “Flamingo”. The name of the album was inspired by the state slogan of Nevada, but very little else from “Battle Born” is inspired. Two types of songs can be found on the album: the stadium rock song – which consists of big guitar riffs that lead to a crescendo chorus; and the ballad – which begins softly and then meanders without ever really taking you anywhere. There are some exceptions from the twelve-song tracklist that manage to standout from the monotony. “Heart Of A Girl” begins with a beautiful sweeping bass intro, which then carries the song along perfectly. Its simplicity is the song’s greatest asset. “From Here On Out” starts in a high tempo and continues in such an upbeat manner that it is hard not to find yourself bobbing your head or tapping your foot along. The album’s title track concludes the album, despite being its best song. It starts with a wonderful guitar intro that is backed up nicely with keyboards. The song also features the best guitar riff during the breakdown and the keyboard outro makes it a very enjoyable and complete song. For anyone who expected a ‘Hot Fuss II’, the new album will be a disappointment. But it does have some positives; sadly with the exception of the single “Runaways” those positives are featured in the final third of the album.